I recently came across what I believe to be a wardrobe staple dress and I can’t wait to tell you all about it. We planned on taking a family portrait with my in-laws during our trip to Marco Island in April (check out that post here) and while shopping for what to wear in the picture, I came across this dress. I felt like it would be perfect and match the color scheme we were going for really well. Turns out I ended up wearing a romper because it was threatening to storm during our photos and I knew a wet white dress could be somewhat of an embarrassing situation if you know what I mean. Let me tell you though, this dress has been on rotation all. summer. long. It’s been my go-to bbq, shower, vacation, church, birthday party and date night dress because you can dress is down (throw a jean jacket over it and wear it with flip flops) or up (add some strappy heels, fun earrings like these or these and voila!). The fabric will keep you cool and the cut will look great on just about any body type. Not to mention the fact that this dress is extremely forgiving. So grab that sourdough roll out of the bread basket and then order some desert because nobody will know in this dress, I promise. I HATE to admit this but guess what I really love about it? It’s not off the shoulder. Don’t get me wrong. 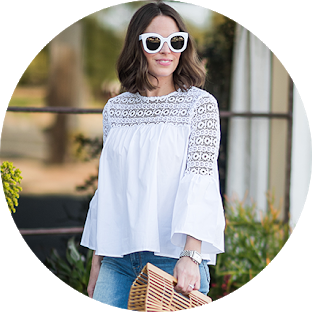 I’m all over the cold shoulder look but let’s be honest…the strapless bra situation, plus the 100 degree heat we’ve had plus the fact that I’m pretty much always running after a toddler? I just need a break and this just seems so much more secure. Plus it comes in a bunch of colors and is on SALE! Happy shopping and as always, thank you so much for following along! PS- For reference, I’m wearing an XS and think this dress runs large enough to order one size down.